The Baltoro Glacier in the Karakoram, Baltistan, Azad Kashmir Pakistan. At 62 kilometres (39 miles) in length, it is one of the longest alpine glaciers on earth. On Earth, 99% of glacial ice is contained within vast ice sheets in the polar regions, but glaciers may be found in mountain ranges on every continent except Australia, and on a few high-latitude oceanic islands. 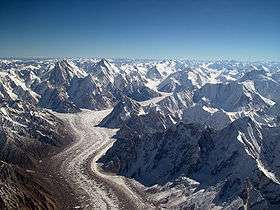 Between 35°N and 35°S, glaciers occur only in the Himalayas, Andes, Rocky Mountains, a few high mountains in East Africa, Mexico, New Guinea and on Zard Kuh in Iran. Glaciers cover about 10 percent of Earth's land surface. 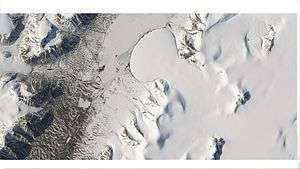 Continental glaciers cover nearly 13,000,000 km2 (5×10^6 sq mi) or about 98 percent of Antarctica's 13,200,000 km2 (5.1×10^6 sq mi), with an average thickness of 2,100 m (7,000 ft). Greenland and Patagonia also have huge expanses of continental glaciers. Glacial ice is the largest reservoir of fresh water on Earth. 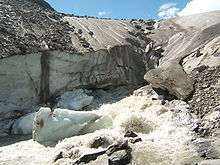 Many glaciers from temperate, alpine and seasonal polar climates store water as ice during the colder seasons and release it later in the form of meltwater as warmer summer temperatures cause the glacier to melt, creating a water source that is especially important for plants, animals and human uses when other sources may be scant. Within high altitude and Antarctic environments, the seasonal temperature difference is often not sufficient to release meltwater. 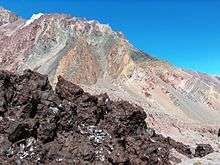 Because glacial mass is affected by long-term climactic changes, e.g., precipitation, mean temperature, and cloud cover, glacial mass changes are considered among the most sensitive indicators of climate change and are a major source of variations in sea level. A large piece of compressed ice, or a glacier, appears blue as large quantities of water appear blue. This is because water molecules absorb other colors more efficiently than blue. The other reason for the blue color of glaciers is the lack of air bubbles. Air bubbles, which give a white color to ice, are squeezed out by pressure increasing the density of the created ice. The word Glaceon is a loanword from French and goes back, via Franco-Provençal, to the Vulgar Latin glaciārium, derived from the Late Latin glacia, and ultimately Latin glaciēs, meaning "ice". The processes and features caused by or related to glaciers are referred to as glacial. The process of glacier establishment, growth and flow is called glaciation. 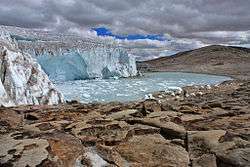 The corresponding area of study is called glaciology. Glaciers are important components of the global cryosphere. Glaciers are categorized by their morphology, thermal characteristics, and behavior. Alpine glaciers, also known as mountain glaciers or cirque glaciers, form on the crests and slopes of mountains. An alpine glacier that fills a valley is sometimes called a valley glacier. A large body of glacial ice astride a mountain, mountain range, or volcano is termed an ice cap or ice field. Ice caps have an area less than 50,000 km2 (19,000 sq mi) by definition. 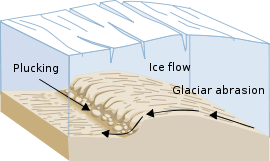 Glaciers form where the accumulation of snow and ice exceeds ablation. The area in which a glacier forms is called a cirque (corrie or cwm) - a typically armchair-shaped geological feature (such as a depression between mountains enclosed by arêtes) - which collects and compresses through gravity the snow which falls into it. This snow collects and is compacted by the weight of the snow falling above it forming névé. Further crushing of the individual snowflakes and squeezing the air from the snow turns it into 'glacial ice'. This glacial ice will fill the cirque until it 'overflows' through a geological weakness or vacancy, such as the gap between two mountains. When the mass of snow and ice is sufficiently thick, it begins to move due to a combination of surface slope, gravity and pressure. 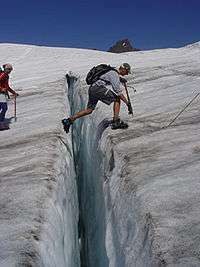 On steeper slopes, this can occur with as little as 15 m (50 ft) of snow-ice. A packrafter passes a wall of freshly-exposed blue ice on Spencer Glacier, in Alaska. Glacial ice acts like a filter on light, and the more time light can spend traveling through ice the bluer it becomes. In glaciated areas where the glacier moves faster than one km per year, glacial earthquakes occur. These are large scale temblors that have seismic magnitudes as high as 6.1. The number of glacial earthquakes in Greenland peaks every year in July, August and September and is increasing over time. In a study using data from January 1993 through October 2005, more events were detected every year since 2002, and twice as many events were recorded in 2005 as there were in any other year. This increase in the numbers of glacial earthquakes in Greenland may be a response to global warming. 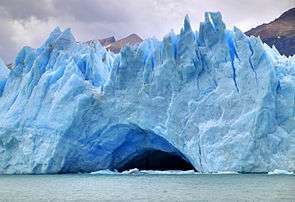 For more details on this topic, see List of glaciers and Retreat of glaciers since 1850. Before glaciation, mountain valleys have a characteristic "V" shape, produced by eroding water. During glaciation, these valleys are often widened, deepened and smoothed to form a "U"-shaped glacial valley. The erosion that creates glacial valleys truncates any spurs of rock or earth that may have earlier extended across the valley, creating broadly triangular-shaped cliffs called truncated spurs. Within glacial valleys, depressions created by plucking and abrasion can be filled by lakes, called paternoster lakes. If a glacial valley runs into a large body of water, it forms a fjord. ↑ "Glossary of Meteorology". American Meteorological Society. Retrieved 2013-01-04. 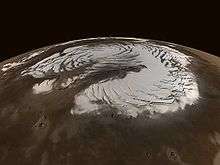 ↑ "Types of Glaciers". National Snow and Ice Data Center. ↑ Bindschadler, R.A.; Scambos, T.A. (1991). "Satellite-image-derived velocity field of an Antarctic ice stream". Science. 252 (5003): 242–46. doi:10.1126/science.252.5003.242. ↑ "Description of Ice Streams". British Antarctic Survey. Retrieved 2009-01-26. ↑ "What causes the blue color that sometimes appears in snow and ice ?". Webexhibits.org. Retrieved 2013-01-04. ↑ "C.D. Ollier: ''Australian Landforms and their History'', National Mapping Fab, Geoscience Australia". Ga.gov.au. 2010-11-18. Retrieved 2013-01-04. 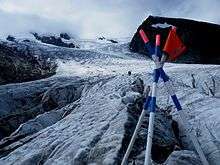 ↑ "Hawaiian Glaciers Reveal Clues to Global Climate Change". Geology.com. 2007-01-26. Retrieved 2013-01-04. ↑ "French Colonies - Crozet Archipelago". Discoverfrance.net. 2010-12-09. Retrieved 2013-01-04. ↑ "Yukon Beringia Interpretive Center". Beringia.com. 1999-04-12. Retrieved 2013-01-04. ↑ "Kargel, J.S. et al. :''Martian Polar Ice Sheets and Mid-Latitude Debris-Rich Glaciers, and Terrestrial Analogs'', Third International Conference on Mars Polar Science and Exploration, Alberta, Canada, October 13-17, 2003 (pdf 970 Kb)" (PDF). Retrieved 2013-01-04.